I kept waiting for some moment of clarity, when I would feel I understood the war well enough to have any opinion worth sharing. Let's just say that moment never came, despite numerous conversations with people from all sides. The conflict has been very much on our minds because Nina, the housekeeper we had this past year, is from Georgia--and her daughters had to evacuate their home due to the fighting. I felt absolutely horrible then delivering more bad news--that we would no longer need her to work for us... (I *did* give her more than two weeks' pay extra, two weeks' notice, and I'm trying to find her a new job). But I just had to leap at the chance to hire Amina, the housekeeper/nanny who worked the past three years for our British friends described in the previous post. Nina speaks minimal Russian, and as a result I couldn't rely on her to help with the girls. Now that I'm working full-time, it was imperative that I find someone who could. The irony of it all is that Amina is from South Ossetia, ethnically from the group of people at war with Nina's Georgian kin. Now that we've had one week with Amina, I realize just how much we really did need her... And what a difference her presence will make for the girls and me. 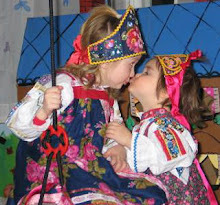 Katya and Natalia have always liked her; as sad as they were to lose their friends Ally and Katie, they feel very lucky to have "inherited" their nanny. The three of them have already bonded, doling out hugs, kisses and care. Amina can and will back me up as a parent, maintaining discipline and providing the girls with the structure they need. I leave mornings before they do, which could have inspired much crying and stress--but everything is going rather smoothly with her help. I can already see what an impact our daily interaction is also having on our Russian. I hadn't quite realized how little Russian we've used over the past three years... Without any Russian-speaking help at home, we primarily spoke English. I usually spoke Italian with the one good babysitter we had one or two mornings a week, and I didn't learn anything from speaking Russian with Nina--since my Russian was stronger than hers. I'll learn a lot of new vocabulary and grammar from Amina. The girls interact with her in Russian, too--while she can speak intermediate-level English, she hasn't let Natalia in on that little secret (yet). Her presence is making Natalia's transition back to her Russian-language kindergarten much easier; Chris and I are surprised (and relieved) to hear her speech evolving so quickly. 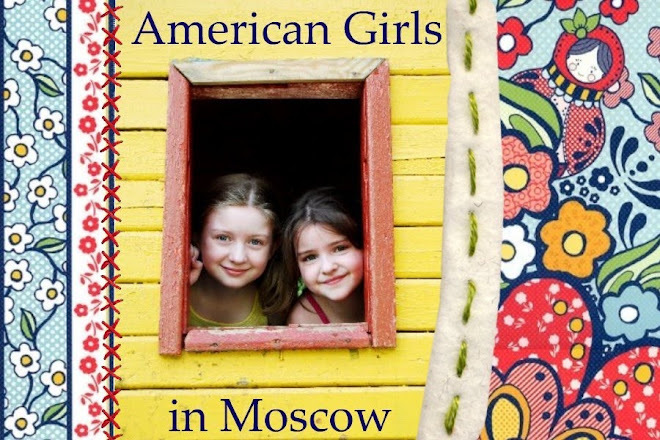 In just three days, Amina knew Katya well enough to pick out the perfect birthday presents for her: an "American Girl" type agenda/quiz book to do with your friends (I'd never seen anything like that in Russian before! ); a school assignment book designed to look as if it were from the 1800s (Katya loves things that are old-fashioned/historical); and a Russian encyclopedia. Katya immediately delved into it. Nina was an excellent cook, making Georgian foods that Chris particularly loved--but Amina's skills (she's a trained caterer, mainly cooking traditional Russian cuisine) are more up the girls' alley. I must say, it's nice to have the responsibility of trying to get them to eat dinner on weeknights lifted from my shoulders. They have given her cooking four thumbs' up and now there's less fighting at dinnertime, too. Ally and Katie were rather picky eaters, so Amina was used to that... The transition has been rather easy. She's been busy this week reorganizing our kitchen, something that desperately needed to be done... It will be nice when every last touch is complete on our "makeover" of the apartment. (Photos soon). I ended up doing the big weekly cleaning last night, but even though I'd worked all day (and week), I didn't mind; having the extra help with the girls significantly reduced my stress. The poem she's supposed to learn is not that hard and I have no idea what's going on in her head and heart... I let Amina go and now I'm trying to deal with this myself. So much for fun afternoon plans; if we have to stay home all day in order to get Katya to get her emotions under control and her work done, well, that's what we'll have to do... It stinks, though. I want to go running... I'd like to take them swimming... There's a lot going on in the city for Moscow City Day... It's too bad that Natalia gets stuck at home as a result... This might just be our last nice and warm weekend until next spring! How curious that your home situation would involve both (or two of) the entities in the Georgian conflict. I know what a blessing it is to have a good housekeeper. Despite the frustrations we've had with ours, I know our kids love her -- even though I wish I could rely on her a bit more to enforce discipline. This past week the kids got in trouble for going into a neighbor's garden and tearing down banana trees. What language did your first nanny / housekeeper speak? Is it simply "Georgian"? I know it's no comfort or help to you, but it is sort of a relief to me to hear you describe the schoolwork troubles with Katya. It at least makes me feel like I'm not alone when I battle my daughter to do some work -- usually math. I'll often worry I'm trying to get her to do something she can't and that I need to backtrack and do something simpler -- she we'll wail it is too hard. And then every so often she'll be in a good mood and finish the same sort of problem that was *way* *too* *hard* within seconds. So frustrating. Who Said Purple Is Only For Punks?